What wine goes with celebrations? Champagne, of course. What wine goes with contemplation? Perhaps an aged Brunello or Burgundy or Bordeaux. What wine goes with sitting on the porch on a summer’s evening? Rose, surely. 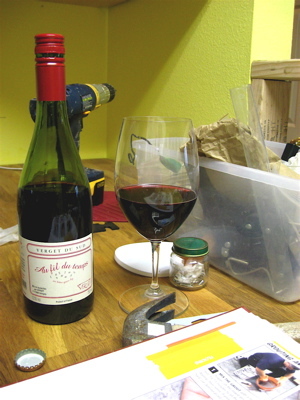 What wine goes with a short break from home improvement gyrations? I have no definitive answer, but in this case it’s Verget du Sud Au Fil Du Temps (as time goes by), a French vin du table (table wine) that I paired with a microwaved Michel Angelo’s Chicken Parm last night. One of the things that makes this an excellent wine for the occasion is that it won’t add to the mounting Home Depot and Lowes bills you’re likely to rack up during your remodel project; it’s priced at Specs for only $6.62 a bottle. Dark red in the glass. The wine presents a yeasty nose, with earthy blueberries, violet notes and black pepper aromas. Earthy on the palate too, with just enough structure to rap the berry fruit on the knuckles and tell it to sit up straight. Slightly raw like a nouveau, but not scratchy at all. More of a corduroy texture: soft but with ridges. Nice acid, and even earthier with the bland frozen dinner. The wine’s a blend of Syrah, Carignan and Cabernet Sauvignon; the idea is that Burgundy negociant Verget takes all its leftover juice from all the fine wines it blends every year and tosses them into this “bistro blend.” Jean-Marie Guffens’ Verget was founded in 1990, and is a good value brand that you can count on, especially for Chablis. Specs has a great offering of their wines. Fortified by a nice big glass and most of Robert Altman’s incredibly goofy movie Popeye (a certified Middleton Family Cult Classic), I’m ready to start back to work. Feel free to try this solution whenever mounting tasks threaten to sweep you away in their wake.